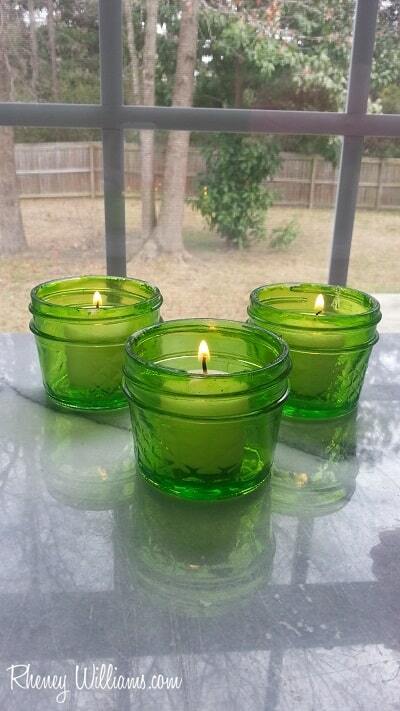 That’s what we’re doing today: Upcycled green tinted glass mason jars (that have already served one purpose and are getting a second chance at life!). Tinted using craft glue and food coloring, you might already have all of your craft supplies hanging out in the kitchen. Who doesn’t love getting double duty out of something, being creative, and saving money in the process? Yes, please! And since the very nature of what we’re doing is ‘green’ ~ we’re recycling the glass, which is about as green (eco-friendly) as you can get and we’re saving green (dollars) by using what we already have, rather than spending money for something new ~ the only logical color choice for these jars is green! So gather together your previously enjoyed glass jars and let’s get to greening! Food coloring : I used neon food coloring in blue and green so that when mixed together, I’d end up with a shade of Green Apple! In terms of the glass jars themselves, I used two different types: One traditional Mason ‘Bell’ jar (with the smooth glass) and five quilted Mason jars (two medium sized and three tiny ones). Before applying paint to your jars, make sure the inside of the glass is free of oil or dirt. Yes, I said the inside because that’s what we’re tinting! 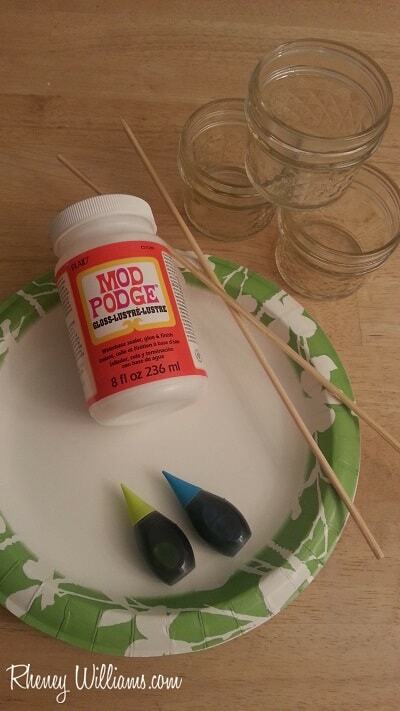 Pour glue into the jar until the bottom is covered and the glue is about ¼ inch deep. You can always add more but the goal is to use as little as possible so you don’t waste it in the next step. 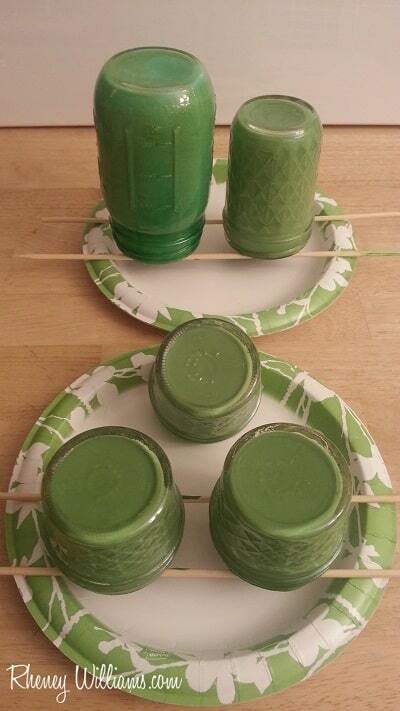 Add your food coloring to create the color you want. I followed the directions on the box of neon food coloring to create a Green Apple. Keep in mind that the color it is now will definitely not be the color it will be when the glue dries. 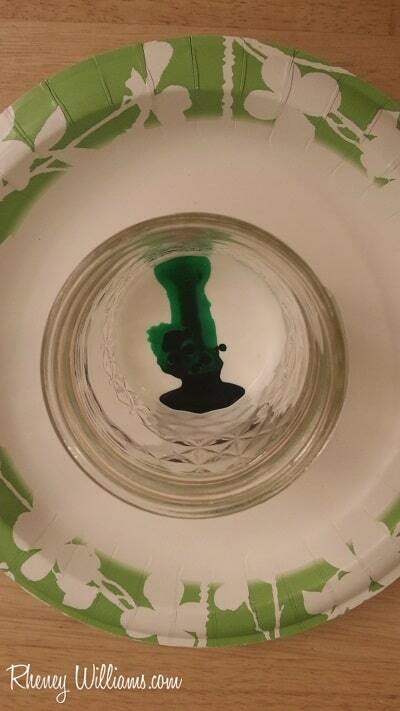 Here’s where my method deviates a bit from the other tutorials you may have seen on this type of glass tinting. Rather than the ’tilt-a-whirl’ way some crafters employ, I find it is much easier to simply screw the lid back on the jar and shake it within an inch of its life! This way, you can ensure full and complete coverage without worrying about the glue pouring out of the jar while you’re swirling it around. Just make sure the lid is actually on and that you have a firm grip on the jar before you start shaking! From here, carefully remove the lid and now you can pour/shake any excess into the next jar or if you’ve reached the end of your line, into the garbage. Once you’ve repeated the process for all of your jars, set up the dowels like a little bridge across the plate or pan and turn each jar upside down, resting the rims on the dowels. Check them every half-hour or so to make sure they’re still dripping and wipe away the excess from around the rim. After they been drying upside down for a couple of hours, turn them back over to dry right-side up. And don’t worry about the color: At this point, you have a very thick, almost murky painted coating lining the jars but you’ll see that they lighten up considerably and will dry with a tinted effect to the glass. Just like these! Pretty amazing, right? And these couldn’t be more economical, at least not when compared to a store-bought tinted glass jar which can easily cost over $2. Now, keep in mind that since these are water-soluble, you can’t use them for real flowers unless you seal the inside with a sealant or by baking them in the oven. 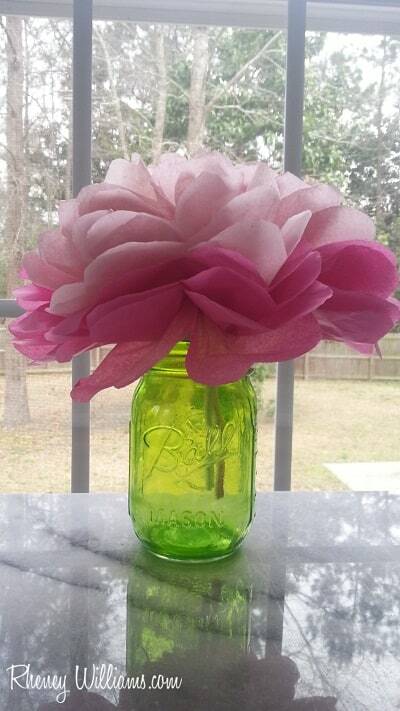 But as long as you don’t fill them with water without taking the proper precautions, you can still use them for paper flowers like this one! Or maybe you’d rather use the little guys as glass luminaries? 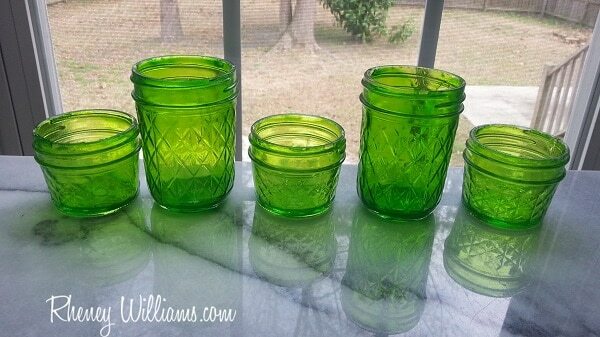 What do you plan to put in your ‘easy being green’ tinted glass jars? Writing on behalf of Dulles Glass and Mirror, an innovative manufacturer of glass table tops, glass shelves, and all other glass and mirror products, is Rheney Williams, who incorporates glass in many of her DIY projects. Follow Dulles Glass and Mirror on Pinterest to see how they’re changing the way glass products are manufactured, customized and delivered. Right?! 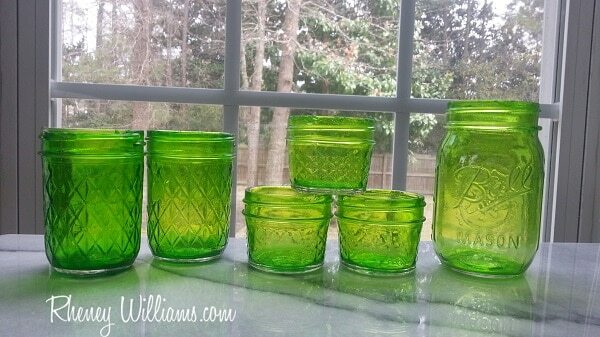 I agree ~ tinted jars are the best! Thanks Katherine!